My name is Ann Harrison and I'm the owner of the Contemporary Retirement Company. I'm a Retirement OptionsTM coach, a pre-retirement trainer, a wellness facilitator with Wellness Inventory, a certified confidence coach and I was the UK’s first 2young2retire certified facilitator. I originally trained as a life coach with CoachU and the Graduate School of Coaching and before that, I spent many years in further education as a lecturer and manager. I’m passionate about helping people like you to get the happiest, healthiest, most vital, productive, energetic, prosperous and fulfilling retirement you could possibly have, whilst, at the same time, helping you to balance having the kind of retirement you want and deserve to have, with planning to meet your future needs. 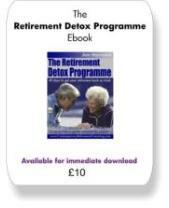 I'm also the author of The Retirement Detox Programme: 40 days to get your retirement back on track and Thought Provokers: Questions You Need to Ask Yourself BEFORE You Retire. But enough about me... What about you? If you 're due to retire in the near future, how will you make the most of the freedom, choice and opportunities available to you? How much thought have you given to the life and lifestyle transitions that retirement will bring? Are you aware of the potential pitfalls associated with retirement and do you have strategies to overcome them? How will you get the retirement you deserve? And if you're already retired, is your retirement everything you hoped it would be? Do you have the retirement you deserve?